After wandering around Onyx for a long time not knowing where the bosses would spawn, I decided to create my own map. At the time this project started, there were only two *cough*crappy*cough* maps out there. If you scroll down to the link section, you'll see that two other people felt the same way as me and started their own mapping projects of The Onyx Chambers. The special thing about this map is that you can click on a boss spot on the map and get info about what loot that specific boss drops. Hope you like this map, and feel free to post some feedback at the forums. Please do not duplicate or re-post this map anywhere else on the web. 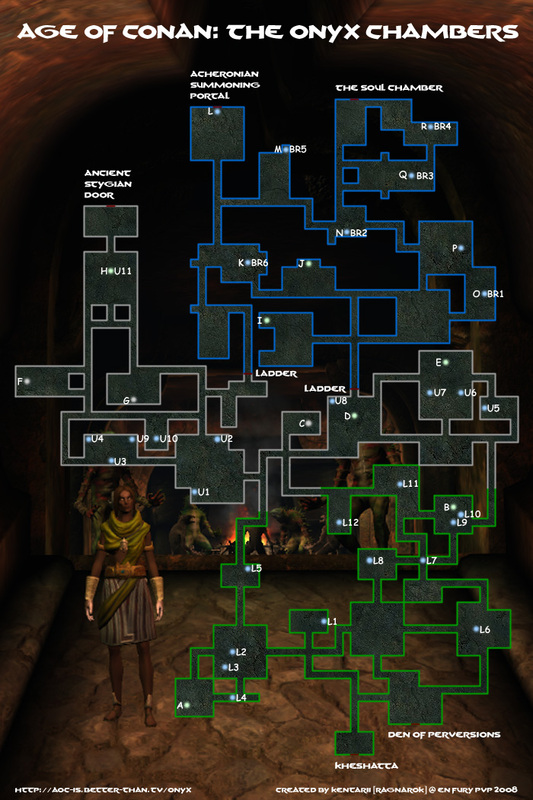 I do not want outdated versions of this map floating around various forums which never get updated. A link to this page however is very much appreciated. Rare bosses have placeholders, so you have to kill the normal mobs/bosses before the rare one spawns. Loot in bold means it has been confirmed by me. Bela for posing for this picture. Ragnarok for being a kickass guild. The persons who gathered the info in the links below. Page generated in 0.083 seconds using 1 queries, consuming 1506.180 kB of memory.